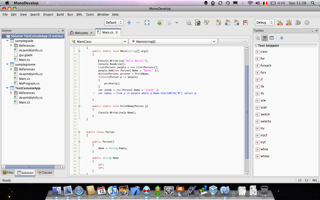 I installed Mono and MonoDevelop again this week but found out rather quickly that not much has changed in MonoDevelop since the last time I used it. MD went 2.0 recently while Mono is now 2.4. 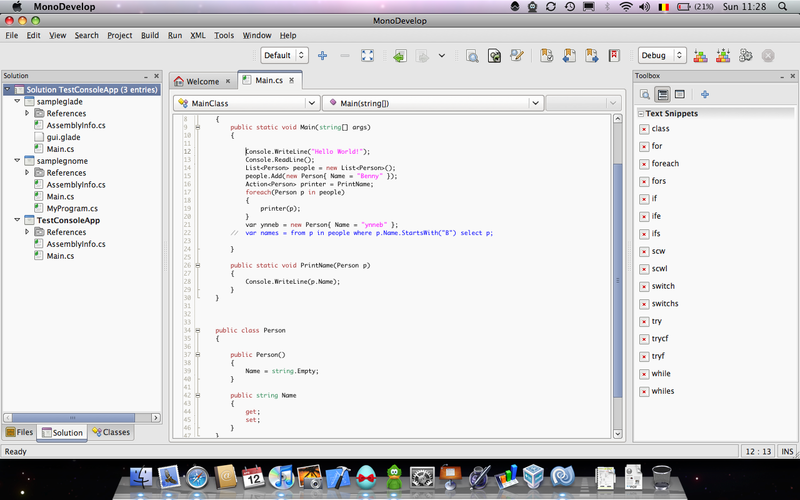 I probably should have guessed that all the problems I ran into using MD were still not resolved because of the red letters on their site discouraging using MonoDevelop on the Mac. On the forums however I found out that in the next version a lot of improvements should make it into the Mac distribution. Mono is closing in on .Net, it was good to see that a lot of the c# language enhancements as well as new .NET features have made it into the platform. Including automatic properties, lambdas, etc. Linq is said to be supported as well but I was unable to write even a simple query. I never got the select statement to work. Could be me though. What I did find interesting was how you can create native looking applications for almost every platform while using the same Mono core of your application. I really want to try that out! On the Mono site you get linked to Cocoa# for OSX but that project seems to be rather silent though a user made a recent contribution. I did like the way on how you could use the existing development tools available, xCode and Interface builder so you would not need to learn another application. There’s a video demonstrating the approach. A more active project, with the latest version released in March, is Monobjc which seems to have the same goal as Cocoa#. I’ll probably try this one out first. Anyone with some Objective-C and Cocoa experience will recognize the way it works in this tutorial. Though at first glance you can’t use xCode to write your c#. Oh yeah last time I checked you can use Spring.Net with Mono too.